In this guide, the term “eXo add-on” denotes anything that enhances the eXo extensibility - is developed and distributed by eXo or any third-parties or any individual developers. An add-on may comprise a set of extensions, customizations, xml configurations, applications, templates or any new services. Portal extension Introduction to the portal extension mechanism and details to create a portal extension - the most commonly used technique that allows extending the portal container configuration. Packaging How an add-on should be archived so that you can use the Add-ons Manager to install or uninstall it. Deployment Ways to deploy an add-on into the eXo Platform server and detailed steps to perform a local deployment with the Add-ons Manager. Publishing How to register an add-on in the catalog and information declared for one catalog entry. eXo Web Conferencing connector a How-to develop your own Web Conferencing connector. Technically, the eXo Kernel provides an extensibility mechanism that extends the portal container configurations. This extensibility mechanism allows more services and resources to be loaded at start-up. In other words, thanks to the extensibility mechanism, you can extend the portal resources in an almost plug-and-play fashion - simply by dropping in a .war archive with the resources, and configuring its position on the portal’s classpath. With this way, customization of the portal does not involve unpacking and repacking the original portal’s .war archives. Instead, you can override a portal resource by including it in your extension in the same path as that of portal.war. In case many extensions include a same resource, they override each other too. So, take care that only the last loaded one will take effect. include it in the war instead to make the package simpler, as in the diagram above. See details below. 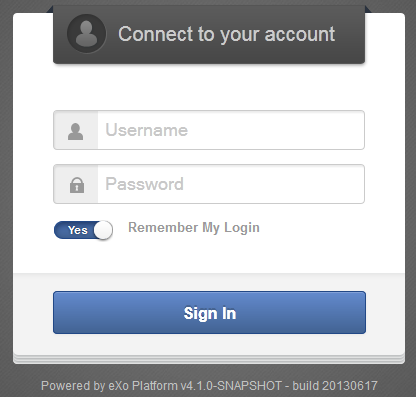 eXo Platform comes with a pre-configured PortalContainer named “portal”. The configuration of this portal container ties the core and the extended services stack. The default portal container is started from portal.war and naturally maps to the /portal URL. The webapp portal.war is the base that can be overridden by other extensions. A unified ClassLoader: Any classpath resource, such as property files, will be accessible as if it was inside portal.war. This is valid only for resources but not for Java classes. A unified ServletContext: Any web resources contained in your custom-extension.war will be accessible from /portal/ uri. When you are extending an existing portal container, the name of the portal in the extension’s configuration should be the same as that of the existing portal container. By using this approach, the configuration (and many other aspects) of an existing portal container can be customized, for example, Groovy templates of portlets, porlet skins, CSS and Images, navigations and pages or localizations. If you ship servlets or servlet filters as part of your portal extension, and these servlets/filters need to access specific resources of a portal during the process of the servlets or filters request, make sure that these servlets/filters are associated with the current portal container. The proper way to do that is making your servlet extend the org.exoplatform.container.web.AbstractHttpServlet class. This will not only properly initialize the current PortalContainer for you, but also set the current thread’s context ClassLoader to servlets or servlet filters which look for resources in associated web applications in the order specified by dependencies configuration. Similarly, make sure that your filter class extends org.exoplatform.container.web.AbstractFilter. Both AbstractHttpServlet and AbstractFilter have the method named getContainer(), which returns the current PortalContainer. The benefit is you can remove the jar if it does only one thing: to configure the extension. In this tutorial, you will learn how to create a portal extension. The project consists of a webapp (war) module. The sample code can be found at eXo Samples repository. Note that in this file you define the file name of the webapp. It will be custom-extension.war. You can change it here but you will have to change other configuration accordingly. This file is supposed to be a service configuration file, but you do not configure anything so far. In the examples that follow and in some later tutorials of the Developer guide, you will write more configuration when necessary. priority: Should be set to a value upper than 100 to override the extension platform-extension.war. dependencies: a collection of portal extensions. Here it is only custom-extension. custom-extension: it is thee file name of the .war and the display-name you configure in web.xml should match each other. Build the project with mvn clean install command. You will have a war named custom-extension.warin /target/ folder. Copy custom-extension.war to the $PLATFORM_TOMCAT_HOME/webapps/ directory. Add custom-extension.war to $PLATFORM_JBOSS_HOME/standalone/deployments/ platform.ear directory. In case you want to make your portal extension a standard add-on so that users can install it using eXo Add-ons Manager, the packaging will be different. The section Packaging shows you how. The file jboss-deployment-structure.xml is not required. The .war is deployed into $PLATFORM_JBOSS_HOME/standalone/deployments/platform.ear. A service (also called component) can be any Java class. At minimum you write an empty interface, and an implementation with a constructor. You should learn more about service, initial parameter and plugin and all about service configuration in Service configuration for beginners and Service configuration in details. So by default it is portal.war!/conf/common/locales-config.xml. To add a locale you want, include a modified copy of this file in your extension: custom-extension.war!/conf/common/locales-config.xml. Of course the language support involves translating lots of resources. For now you just add a locale like ve (for Venda), so a user can choose it in the list of language options, but no resource would be found for Venda, then the default language will be used. You can override it once again in your portal extension, for example custom-extension.war!/login/jsp/login.jsp. The shared layout is applied for all pages of a portal. You can override this resource by including it in your extension custom-extension.war!/WEB-INF/conf/portal/portal/sharedlayout.xml. Remove a built-in portlet from the top navigation bar (for example, the “Help” link). Adding your portlet here so that all your pages will have that portlet. See Customizing a shared layout for more instructions. JARs: $PLATFORM_TOMCAT_HOME/lib/ (Tomcat), or $PLATFORM_JBOSS_HOME/standalone/deployments/platform.ear/lib/ (JBoss). WARs: $PLATFORM_TOMCAT_HOME/webapps/ (Tomcat), or $PLATFORM_JBOSS/HOME/standalone/deployments/platform.ear/ (JBoss). Other files and folders located at the root of the zip archive will be copied to the home directory of the PRODUCT server. An ASCII file named README may be placed at the root of the archive. This file is never installed. Instead, it is displayed in the console after a successful installation. You can use Maven assembly plugin to package your add-on project. Manually install WARs and JARs and other files into the webapps, lib folders and the corresponding directories of eXo Platform. 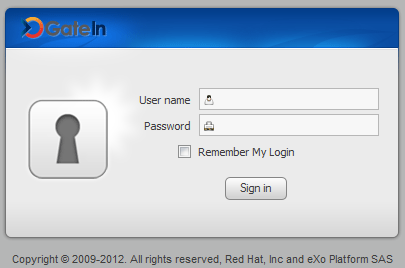 Use the Add-ons Manager - the standard way to install, uninstall, and update add-ons in eXo Platform. In this way, you will avoid the manual registration that might cause errors. The Add-on Manager allows you to simplify your add-ons management in both Tomcat and JBoss EAP by copying all JARs and WARs in one step and uninstalling them without searching in the lib directory (more than 400 jars) and in the webapps directory (more than 50 wars). Deploy an add-on from the eXo Add-ons repository, as detailed in Administrator Guide - Installing/Uninstalling add-ons. However, to follow in this way, the add-on should be first registered and validated by eXo administrators. Deploying a local add-on, as below. Create a local catalog named local.json under $PLATFORM_HOME/addons/ with the minimal content. This local catalog will be merged with the central one at runtime. Now you will see your own add-on zip file in $PLATFORM_HOME/addons/archives. If you wish to share your add-on publicly, simply click here to tell eXo team about your add-on (you must sign in to access the page). The team will review it and possibly add it into our eXo centralized catalog, so that it can be accessed by any eXo instance. The Add-ons Manager relies on catalogs containing metadata of the add-ons. 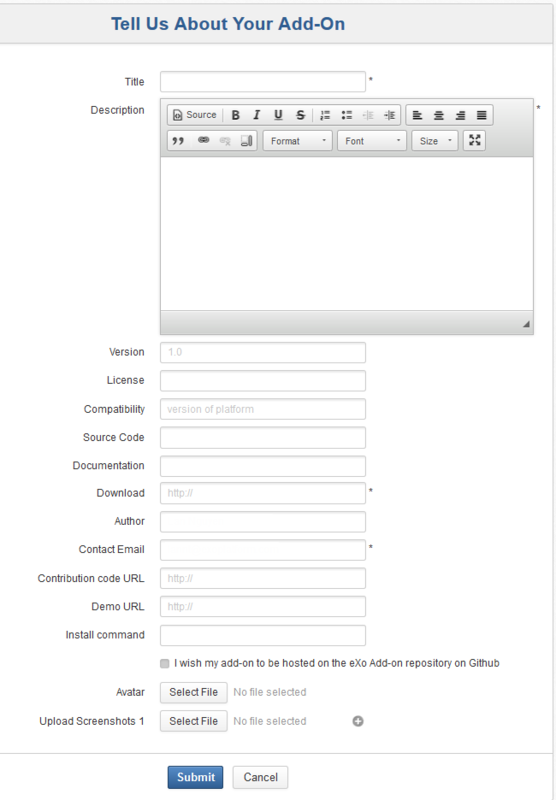 By default, a remote catalog is downloaded from http://www.exoplatform.com/addons/catalog. You can use your own catalog by adding the --catalog=$URL option (where $URL is the alternative location for the catalog) to the addon commands. The remote catalog is cached locally and each catalog URL has a separate cache. When you create a local catalog ($PLATFORM_HOME/addons/local.json) that defines the catalog entries for your own add-ons, it will be merged with the remote catalog at runtime. If you add the --offline option when installing the add-on, only the local and cached remote catalogs (if any) are used. If a version of an add-on is duplicated between the remote and local catalogs, the remote one is used. If there are some duplicated versions in the same catalog, the first one is used. To write your own (local or remote) catalog, you can learn the default catalog (linked above) that is a JSON file. id (*) Id and version is used to identify an add-on (use id:version pattern in commands). Duplicated entries are treated as said above. version (*) Version string of the add-on. unstable This is “false” by default. Set it to “true” to warn of an unstable version (unstable versions are not listed unless --unstable is used). name (*) The display name of the add-on. description The brief description of the add-on. releaseDate The release date of the add-on (Date format: YYYY-MM-DD). sourceUrl The URL where to find the source of the add-on. downloadUrl (*) Where to download the package. Use http:// for a remote add-on or file:// for a local add-on. vendor (*) The vendor name of the add-on (for example, PRODUCT). license (*) The license of the add-on (for example, LGPLv3). licenseUrl The URL containing an ASCII version of the license to be displayed by the CLI. mustAcceptLicense “True” means it requires the user to explicitly accept the license terms before installation. This is set to “false” by default. ``supportedDistributions` ` (*) The eXo Platform distributions that support the add-on (for example, Community, Enterprise - should be lowercase, comma-separated). supportedApplicationSer vers (*) The application servers that support the add-on (for example, Tomcat, JBoss - should be lowercase, comma-separated). compatibility The version range (in Maven version range format) that the add-on is compatible. No compatibility check is performed if this is absent. screenshotUrl The HTTP URL pointing to a screenshot of the add-on. thumbnailUrl The HTTP URL pointing to a thumbnail of the add-on. documentationUrl The HTTP URL pointing to a documentation of the add-on. author The author of the add-on. authorEmail The email address of the author. Follow GMD module patterns as much as possible. Avoid to write inline scripts if possible. Avoid to include libraries externally (in script tag) if possible. When using JQuery, use the built-in shared module “jquery” if possible. Use GMD adapter configuration if you need other JQuery versions and extensions. eXo Web Conferencing add-on enables you to plug-in and manage any Web Conferencing solution in eXo Platform. You can use eXo Web Conferencing core to develop your own connector which will implement the call provider you need to embed in eXo Platform. In this section, we will introduce the architecture of eXo Web Conferencing add-on and how to develop a custom connector allowing you to embed a call provider in eXo Platform. 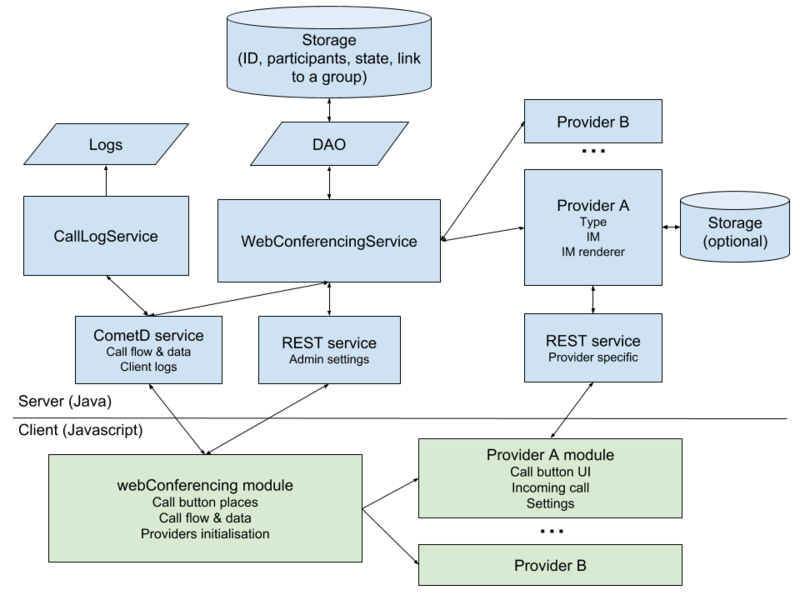 The following diagram shows the different parts involved to perform a Web Conferencing call. Adding call buttons in eXo Platform different pages. Exchanging call data and notifying call parties about the status. Saving the call state and linking between group calls. Administrating eXo Web Conferencing: enable/disable a provider, managing the settings via the UI. Building a call button UI. Running a call from the UI interface. Establishing the connection flow in a call and updating the call state. eXo Web Conferencing add-on is a portal extension installed by default in eXo Platform. A call connector is also a portal extension which uses the eXo Web Conferencing core. The connector should provide an implementation of its call button which is added by the Web Conferencing core in users profiles, spaces and chat rooms. The connector implementation consists of a server code and a client application with user interface to run calls. Create the connector project respecting the developement environment described here. We recommend you to clone our template project as it contains maven modules with eXo Web Conferencing dependencies and packaging. You should make your customizations on it: rename package, classes and variables and if needed include third-party libraries that your connector may use. Implement Java Service Provider Interface (SPI): It is the java class of your call provider which should extend the CallProvider class. * My Connector provider implementation. * Instantiates a new My Call provider. Create a portlet which will be responsible of loading and intializing your call provider in the eXo Platform UI. Configure your connector extension, your provider plugin and your portlet in META-INF/exo-conf/configuration.xml file.